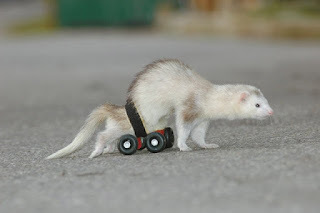 What likely fate do you suppose would befall a ferret, found abandoned and paralyzed? But the wheelchair is not the only therapy that Scooter receives. Once a week, Higbee and Scooter head back to the vet's office where the ferret undergoes acupuncture.